If you're looking for a stylish new kettle with quality features at a great value price, take a look at the Russell Hobbs Black Textures Kettle bringing you a level of functionality you won't find in other kettles in its price range. The Textures Black Kettle combines a high gloss finish with matt accents for a premium feel meaning it will bring style to any kitchen work top. With a 1.7litre capacity jug, it’s big enough to make up to six cups, making it an ideal kettle for family homes but if you’re one for a sneaky brew the rapid boil feature means you can have a brew in hand in under one minute*. 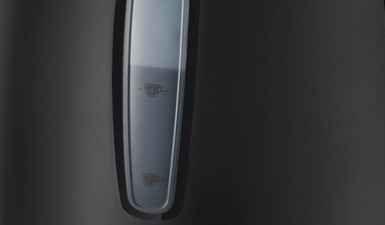 The rapid boil feature also means that you can become more energy efficient and save up to 66% energy when making one cup. 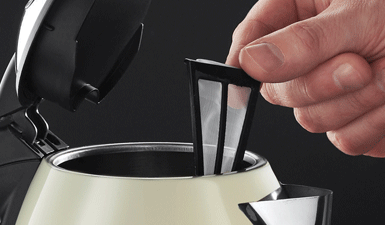 The kettle has a perfect pour spout so all of the water goes into the cup with fewer splashes and spills keeping your work surface mess-free. Check water levels without having to lift the lid and see how much is going in as you fill.